Okay wait, first the face and now this? The mars rover snapped a picture on the Martian surface and guess what we found – a rat, well a rat looking something on the planet. NASA’s Mars rover Curiosity snapped this panorama of the “Rocknest” site with its MastCam camera on sol 52 of the mission which was on Sept 28th 2012. Now a UFO enthusiast realized there was a camouflaged rodent hiding in the rocks. There is no evidence supporting the claim that it was actually a rat, it may merely be a rock looking like a rat. 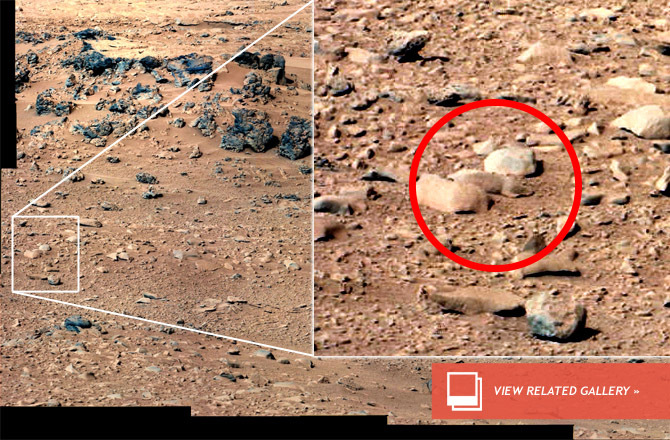 This certainly isn’t the first time shapes on Mars have fooled the brains of many. The name for this psychological phenomenon: pareidolia where our brain is trained to recognize or look for familiar shapes or faces in objects around us.